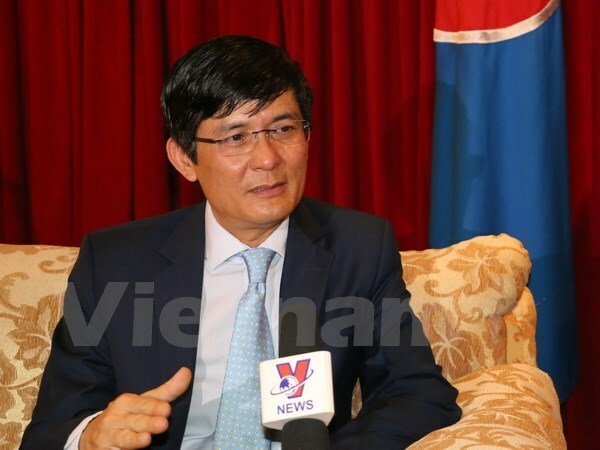 Jakarta (VNA) – Head of Vietnam’s Permanent Mission to ASEAN Ambassador Nguyen Hoanh Nam highlighted the bloc’s achievements and Vietnam’s role in the process during an interview recently granted to Vietnam News Agency. Nam said since its birth 50 years ago, ASEAN now groups 10 member states and plays an increasingly important role in maintaining peace and stability in the region. ASEAN is considered one of the vibrant and fast-growing economies in the world, with the ASEAN Economic Community being the third largest in Asia and the sixth largest in the world. Its gross domestic product neared 2.55 trillion USD. The bloc is playing a guiding and central role in regional mechanisms and highly appreciated by major countries and international organisations. Since its entry to ASEAN 22 years ago, Vietnam has actively and proactively joined the grouping’s activities, including accelerating the admission of Laos, Myanmar, and Cambodia, launching strategic policies and orientations to the bloc’s cooperation. Vietnam has also actively contributed to fostering solidarity and upholding ASEAN’s central role in maintaining peace and security in the region, including the East Sea issue, he said, adding that Vietnam is one of the first countries to take actions in the bloc’s plans and programmes to contribute to the formation of the ASEAN Community today. In order to achieve goals set in the ASEAN Vision 2025, Nam said ASEAN needs to nurture solidarity and seek common voice in addressing regional challenges while boosting internal connectivity to effectively implement the Master Plan on 2025 Vision, the Master Plan on ASEAN Connectivity 2025, the third working plan on the ASEAN Connectivity Initiative. In external relations, the ambassador said ASEAN needs to take new approach to strengthening ties with countries and organisations, continue to uphold central role in the regional architecture, facilitate trade liberalisation and economic integration, including the early formulation of several agreements on free trade areas with partners. According to the Ambassador, Vietnam will continue contributing to ASEAN’s development via specific initiatives and actions.